The Jacksonville Spring Classic prize list is online now and gets underway at the Jacksonville Equestrian Center April 4th through 14th offering more than $200,000 in cash and awards. Week I will be a Jr. Amateur horse show Friday-Sunday with a $5,000 Marshall & Sterling Hunter Classic Derby and Week II is AA with Level 4 jumpers. 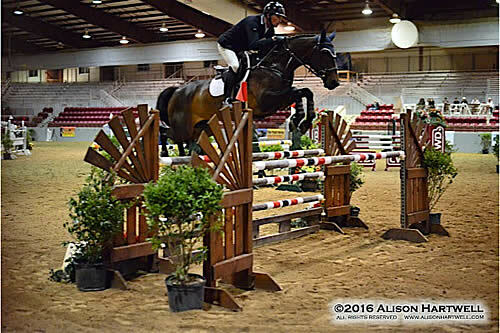 Week II features the $25,000 USHJA International Hunter Derby sponsored by Glen Kernan Golf and Country Club Friday morning on the derby field as well as the $35,000 Grand Prix held in the indoor stadium on Saturday night. The Jacksonville Equestrian Center is a world-class facility featuring a large indoor coliseum with seating for 3,700, two outdoor rings, grass derby field plus schooling rings, and 500 permanent stalls. There are also 78 full hook-up RV spaces available. The Equestrian Center is conveniently located off of Interstate 295, I-10, and US 301 and in close proximity to the Jacksonville International Airport as well as the Cecil Field Regional Airport. The location is ideal for those traveling back from the winter circuits and for all Florida equestrians. Jacksonville, FL (April 24, 2018) – For the third year in a row, the Jacksonville Equestrian Center wowed riders and spectators alike during the Jacksonville Spring Classic, held April 4 through April 15, 2018. The facility, which boasts an impressive set-up including a larger-than-life indoor stadium, several outdoor rings and a derby field, attracted 500 hunter and jumper pairs from as far as Dallas, Texas. The highly anticipated two-week series featured a myriad of hunter and jumper classes, with favorites including the $25,000 USHJA International Hunter Derby sponsored by Glen Kernan Gold and Country Club, and the $35,000 Regional Grand Prix sponsored by Sidelines. Prize money totaled more than $260,000, adding to the allure of the springtime show. The show also offered Opportunity Classes for those riders who are not USEF members and wanted to compete at a USEF-rated competition – cementing the series’ ideal environment for all types of riders, including junior, amateur and professional competitors ranging from unknown, local amateurs to household names, like Kelley Farmer. Farmer, known by the hunter community as a derby queen, captured the coveted the $25,000 USHJA International Hunter Derby aboard her new partner, David Glefke’s Verdict. The impressive pair blew the competition out of the water with 20 points above the runner-up in a field of 23. This year, many competitors were return customers, after enjoying the simultaneous comfort and excitement of previous years’ events. Derek Petersen, of Archer, Florida, for example, commented about how thrilled he was to return to the show. After taking second in last year’s grand prix, much to his pleasure, this year he took the blue in the $35,000 grand prix. Equally happy to participate in the show, first-time Jacksonville Equestrian Center rider and winner of the $7,500 Welcome Jumper, Amanda ‘Happy’ Comly, also expressed her enjoyment. Of course, the show is just as thrilling for spectators as it is for riders. Conveniently located near lodging and attractions, like the Jacksonville Zoo and the Riverside historic district, spectators, who enjoy free admission and parking to the series can, find lots of entertainment. To learn more about this year’s Jacksonville Spring Classic series, go to www.classiccompany.com. For more information about the Jacksonville Equestrian Center and the myriad of equestrian events that call it home, visit www.jaxequestriancenter.com. Week III of the Jacksonville Spring Classics was one for the books when fifteen year old Brian Moggre of Flower Mound, Texas and Major Wager, LLC’s MTM Flutterby won the $35,000 Sidelines Grand Prix against a field of twenty-three seasoned, professional riders. “I’ve won a couple of grand prix before this but I would say it was a pretty tough crowd to compete against,” commented Moggre. MTM Flutterby is only 15.3 hands and Moggre has been riding her for about two years. “I went in and wanted to do my best and it feels pretty good to come out beating your trainers,” he laughed. “When we [Moggre, McCormick and Fenney] walked the course, we knew in the first round you could do a bending 6 or 5 or direct 4. We talked about what would be best and decided that smooth and fast, executing the smoothest route with the least amount of strides was the plan,” he said. Eleven advanced to the jump off round over a course designed by Allen Rheinheimer of Zionsville, Indiana and Moggre had two in the jump off, MTM Flutterby and DDM Equestrian LLC’s Condero 3. First to go was David Jennings of Franklin, Tennessee and KM Farms’ KM Corfina. While their time of 35.421 seconds beat the time allowed of 43 seconds, eight jump faults would see them finish in tenth place overall. Tracy Fenney of Flower Mound, Texas and MTM Farm’s Igor Van De Heibos followed Jennings and KM Corfina with four jump faults in a time of 34.979 seconds which would see them finish in fifth place overall. Moggre, in the irons Condero 3, followed Fenney in the order and earned eight jump faults in a time of 32.694 seconds which would find them placing eighth overall. Dorothy Douglas of West Bridgewater, Massachusetts and MTM Farm’s MTM Malfoy followed Moggre and Condero 3 and with four jump faults in a time of 39.153 seconds finished seventh overall. Diamant’s Legacy, owned and ridden by Derek Petersen of Williston, Florida, followed and the pair turned in the first double clear jump off round in a time of 33.873 seconds and set the new time to beat. Moggre followed Petersen, this time in the irons of Major Wager, LLC’s MTM Flutterby with their own clear round in a time of 30.638 seconds and took the lead, setting the new time to beat. Sitting in the last to go position, Fenney and MTM Farm’s MTM Como No earned 16 jump faults and two jump faults in a time of 44.860 seconds and finished in eleventh place overall. The fastest of the first-round four-faulters was Dorothy Douglas and MTM Farm’s S & L Elite in a time of 85.716 seconds and they wrapped up the class in twelfth place. “MTM Farm had a lot in the jump off and we were all going after each other and it was really fun,” he said. “My win made everyone on the MTM team really happy,” he added. MTM Farm’s Mike McCormick commented, “We think Brian is going to be really famous. I try to not treat him like a ‘prima donna’ here. I make him tack all of his horses and help with lunging and school them,” he said. “The home team and on the road team is doing great. We must have 30 at home and 30 on the road and everyone has really been team players to get us where we are. Everyone has to work hard, because if you don’t, you’re going to have problems,” he said. “Heck, even Tracy helps!” he laughed. “We’ve been doing great and we’re winning in the hunters and the jumpers. We’re qualified for Devon and things look great for MTM,” McCormick added. Moggre has been buying horses from MTM Farm since 2012 and toward the end of 2015 started training with Mike McCormick and Tracy Fenney, moving his three horses to MTM Farm. “For the most part, I live on the road with them. I do online school and am a sophomore. My family has an RV and either my Mom or Dad will be at the shows with me,” commented Moggre. “I have a brother and a sister and it gets pretty hectic at times, but it’s easy to stay at the horse shows and not have to travel to and from home,” he added. “I have a very supportive family and I’m thankful for that,” Moggre said. “I definitely want to make a career out of this like Mike. And of course, my dream since I was a kid was to be on the Olympic team. I love the sport and just want to be successful,” he added. “This year I want to test the waters with the bigger jumps and the Nations Cup team is something I have my eye on this year,” he shared. “My next big show is Devon and that’s one I’m looking forward to,” Moggre said. The $5,000 Horseflight Open Welcome kicked off the jumper action at the Jacksonville Equestrian Center and MTM Farm’s Tracy Fenney took the win in the irons of MTM Farm’s Reve Du Paris with their double clear rounds of 83.239 seconds and 29.310 seconds, well within the 43 seconds time allowed. No one would beat that fast second round and leave the rails up. Brian Moggre and MTM Farm’s Condero 3 came close with their clear second round in a time of 30.013 seconds, but they would settle into a second place overall finish. Third place was awarded to KM Farm’s Corfina, ridden by David Jennings, for their clear second round in a time of 30.724 seconds. Fenney picked up a fourth place with MTM Farm’s Igor Van De Heibos for their clear second round in a time of 32.205 seconds and Jennings returned for a fifth place ribbon with Full Circle Farm’s Harvest Moon for their clear second round effort in a time of 32.472 seconds. Moggre and Major Wager, LLC’s MTM Flutterby earned a sixth place ribbon and Fenney and MTM Farm’s MTM Como No placed seventh. Another MTM Farm rider, Dorothy Douglas, and Erika Guthinger’s Tiger Lion placed eighth, and Cassandra Kahle of Califon, New Jersey and Redfield Farm’s Wall Street earned a ninth place ribbon. Haley Gassel and Westwind Equine Trail’s Werner 61 came in tenth. Douglas returned for an eleventh place ribbon with MTM Farm’s S & L Elite, and Mark Jungherr of Williston, Florida and Susan Banta’s Conte Couleur wrapped up the class with a twelfth place. For complete results, please visit horseshowsonline.com. Fenney and MTM Reve Du Paradis. Week II of the Jacksonville Spring Classic is underway and the $10,000 Horseflight Open Welcome kicked off the jumper action yesterday afternoon and saw a field of 30 horse and rider teams compete in the indoor stadium at the Jacksonville Equestrian Center in Jacksonville, Florida. Course Designer Allen Rheinheimer of Zionsville, Indiana designed the course and set a first round time allowed of 88 seconds and second round time allowed of 45 seconds. Amanda Flint of Long Valley, New Jersey in the irons of the Coverboy Group’s Cairo was the first to go in the order and the first horse and rider team to go clear in a time of 87.867 seconds. Their second round course incurred two time faults in a time of 46.086 seconds. Last week’s $10,000 Horseflight Open Welcome winner, David Jennings, in the irons of Masie Mcswain and Full Circle Farm’s Blue Moon 22, followed Flint and turned in double clear rounds in times of 82.875 and 40.463 seconds, setting the second round time to beat. Flint returned to the arena with the next clear first round, this time in the irons of J and J Imperatore, LLC’s Daisy Chain Vt. They turned in a first round time of 81.957 seconds and their clear second round took the lead from Jennings with their time of 40.089 seconds. Jenna Friedman of Morriston, Florida and her own Glorix Van De Mispelaere followed with a clear first round in a time of 83.886 seconds and clear second round in a time of 40.892 seconds. Aida Sanchez Long of Ooltewah, Tennessee followed with the next clear first round in the irons of Katie Barnette’s Catalyst in a time of 83.886 seconds. Their clear second round in a time of 38.426 seconds would set the new time to beat and take the lead from Flint and Daisy Chain Vt.
Mary Katherine Hargraves of Alpharetta, Georgia and her own Quartus followed with the next clear round in a time of 83.982 seconds. Although their second round was also clear, their time of 44.053 seconds would see them finish in ninth place overall. Dorothy Douglas of West Bridewater, MA rode MTM Farm’s MTM Axel in clear first round in a time of 80.603 seconds. Four faults in their second round in a time of 38.862 seconds would find them out of the ribbons. Tracey Fenney of Flower Mound, Texas and MTM Farm’s MTM Reve Du Paradis was next up and turned in double clear rounds in times of 78.919 and 36.734 seconds which took the lead and set the new time to beat. Bella Equestrian’s Aventador, ridden by Jennings, were next to go and although they turned in double clear rounds in times of 83.680 and 39.116 seconds, their time would not catch Fenney’s and they would settle for fourth place overall. Derek Peterson of Archer, Florida and his own Diamant’s Legacy turned in a clear first round in a time of 80.539 seconds and although they turned in a fast second round in a time of 38.317 seconds, four jump faults would see them finish in tenth place overall. Hargraves returned to the arena, this time in the irons of her own Benedetto for a clear first round in a time of 85.673 seconds, but their second round earned eight jump faults with a time of 44.635 seconds which would keep them out of the ribbons. Fenney and MTM Farm’s MTM Como No followed with the next set of double clear rounds in times of 82.297 seconds and 40.287 seconds which would see them finish in sixth place overall. Douglas and MTM Farm’s S & L Elite followed Fenney and posted double clear rounds in times of 81.029 seconds and 38.543 seconds which put them in third place overall. Mackenzie McGehee of Jacksonville, Florida and her own Fiona V T Paradijs followed with a clear first round in a time of 82.789 seconds; however, eight jump faults in their second round in a time of 43.721 seconds would keep them out of the ribbons. Hayley Waters of Sparr, Florida and Double H Farm’s HB Eli Cash followed with a clear first round in a time of 82.465 seconds, but their second round saw four jump faults in a time of 38.784 seconds which put them in twelfth place overall. Francois Lamontagne of Saint Eustache, Quebec, Canada, winner of Week I’s $35,000 Crescent Grove Advisor’s Grand Prix, was last to go and turned in a clear first round in a time of 86.120 seconds. Their second round had four jump faults in a time of 38.255 seconds and would find them finishing in eleventh place overall. Fenney won the class with MTM Reve Du Paradis and Sanchez Long finished in second with Catalyst. For full results, click here. All sponsorship and press inquiries should be directed to Lisa Engel at lisa@classiccompany.com. Redfield Farm of Califon, New Jersey owned the Hunter Division Week II at the Jacksonville Spring Classic! The $2,500 USHJA National Hunter Derby, presented by Legend, awarded Amari, owned by Emma Richardson and ridden by Cassandra Kahle of Califon, New Jersey, the win after earning a first round score of 91 and a Handy score of 92 for a total score of 183. Whiskey Tango, owned by Lee Cesery and ridden by Megan Young of Jacksonville, Florida, earned a Classic score of 89 and a Handy score of 88 for a total of 177, which took second place. Meadowood Farm’s Sandrimo, ridden by Lauren Schweppe of Ocala, Florida, placed third overall after earning a Classic score of 85 and a Handy score of 89 for an overall score of 174. Kahle also picked up fourth through sixth place. Fourth was awarded to Redfield Farm’s Nino Nacho after earning a first round score of 88 and Handy score of 83 for an overall 171. She rode Redfield Farm’s Balouette to a fifth place finish with a Classic score of 86 and a second round score of 85 for a total of 171. She placed sixth with Isabel Stettinius’ Guest of Honor with an overall score of 169. Lee Cesery’s Swagger, ridden by Camryn Hulsey of Saint Augustine, Florida, placed seventh, followed by Janine Pappas’ Romanov, ridden by Claire Lee of Ponte Vedre, Florida. Ninth place went to Peggy Fuller’s Entreprenur, ridden by Nashea Powell of Jacksonville, Florida. 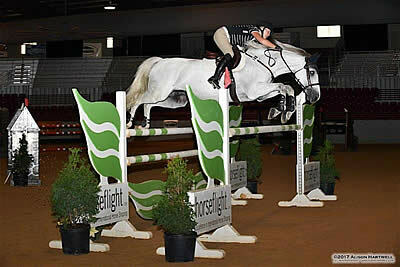 Tenth was awarded to Masterpiece, owned and ridden by Paige Moose of Tampa, Florida. Eleventh was awarded to TM Hills Farm International’s Ingo De Kalvaire, ridden by Dominque Gonzalez of Dunellen, Florida, and Seven Hills, LLC’s Conradi 10, ridden by Kristin Martiniello, wrapped it up in twelfth place. For full results, click here. Redfield Farm’s Giovanni, ridden by Cassandra Kahle of Califon, New Jersey, brought home the Championship in the 3′ Division along with almost $200 in prize money, all for a $5 entry fee! King, owned by Tracy Treace and ridden by Chad Watridge, was Reserve Champion. Kahle went on to win the 3’3″ Pre-Green Hunter Division Championship in the irons of Emma Richardson’s Amari and collected close to $250 in prize money for the $5 entry fee. Redfield Farm’s Nino Nacho, ridden by David Wilbur, rode away with the Reserve Champion honors. Jacksonville, Florida (April 19, 2016) – The inaugural Jacksonville Spring Classic is underway at the Jacksonville Equestrian Center. 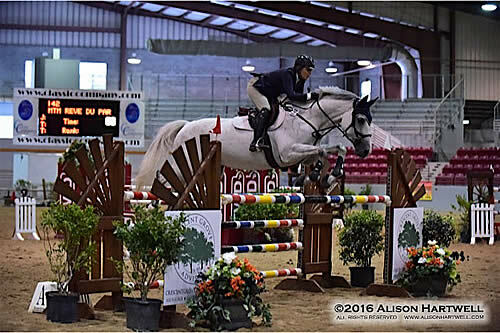 Last weekend, the Jacksonville Spring Classic I kicked off the two-weekend series, which has been described as the perfect place for hunter/jumper riders to wrap up their winter show circuits. The Jacksonville Equestrian Center in Jacksonville, Florida is proud to host the event, produced by the Classic Company. Many riders who spent the winter competing in Florida – either in Wellington at the Winter Equestrian Festival (WEF) or in Ocala at HITS – are stopping in Jacksonville for their final competition in Florida for this season before heading north. A perfect place to layover on the long journey home, the Jacksonville Equestrian Center is located just a few miles off of I-95 and offers over 400 permanent stalls, an indoor coliseum, and several outdoor arenas. “This is our first time at the Jacksonville Equestrian Center,” she said. “It’s a beautiful facility. We really like the indoor arena! This is also the first time I’ve ever jumped Fresh Prince, and I got on him for the first time ever yesterday.” Unger planned to head into the ring and do her best, but even she was surprised by how well the pair clicked together as they sailed over the jumps. As she accepted her blue ribbon at the end of the large class, Unger was already planning to compete on a few more horses before the weekend was over. Riders are also using the Jacksonville Spring Classic I and II as a way to acclimate their horses to an indoor arena after a season of outdoor classes. Indoor jumping arenas, known for having tighter turns on course and different shadow patterns, can especially be a challenge for greener horses. Grand Prix rider Aaron Vale guided Corvett over the fences in the 1.10m class in the massive 123,000 square foot indoor arena, and said, “This is a good experience for Corvett to jump in an indoor. It’s different for the riders and the horses. Things come up quicker.” Vale earned several top placings throughout the weekend at the Jacksonville Spring Classic I. After a fun and competitive first weekend, horses, riders, and the Jacksonville Equestrian Center are all gearing up for another great show at the Jacksonville Spring Classic II on April 20-24, 2016. Nearly every weekend, the Jacksonville Equestrian Center is host to family-friendly events that are open to the public. After the Jacksonville Spring Classic II, cowboys and cowgirls will take over the venue for a roping event where the winner will go home in a new truck on April 29 – May 1. The facility features an enormous indoor arena, outdoor turf arena, outdoor show rings, and more than 400 permanent stalls. Ample RV hookups and vendor spaces ensure exhibitor comfort and convenience. The Jacksonville Equestrian Center, located at 13611 Normandy Blvd. in Jacksonville, Florida, has amenities to host not only equestrian events, but also recreational, sporting, and community events. For more information, visit www.jaxequestriancenter.com or call Penny Gorton at (904) 255-4227. Kelley Farmer and It’s Me. 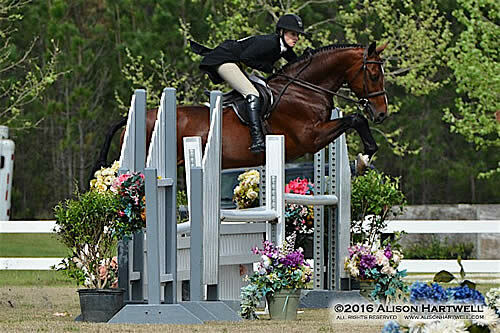 The top hunter riders in the country competed in the Jacksonville Spring Classic’s $15,000 USHJA International Hunter Derby, presented by Glen Kernan Golf and Country Club, Friday afternoon. Kelley Farmer of Keswick, Virginia, winner of the $77,700 USHJA International Hunter Derby, presented by Brook Ledge Horse Transportation, won the class with Bibby Hill’s It’s Me. She also took the second place ribbon with Amanda Hone’s Publicized. She took fourth with Dani Brown Swanston’s Need I Say More as well as eighth and ninth places in the irons of Jane Gaston’s Taken and Kensel, LLC’s Clever Conversation and then wrapped up the class with Gaston’s Because in twelfth place. Farmer led the way earning the highest Classic score of 172 with It’s Me. Their second round score of 194 locked them in for a total of 366 and the win. Farmer and Publicized earned a first round score of 166. Combined with their Handy score of 192.50, their combined score of 358.50 would find them in second place. Emily Williams of Ocala, Florida and Amanda Flint’s Cabana VDL earned a first round score of 163. Their Handy score of 189 for a total of 352 would see them finish in third place. Farmer returned to the winner’s circle to pick up her fourth place with Need I Say More after earning a Classic Round score of 163 and a Handy score of 189 for a total of 352. Artillery Lane, LLC’s Chances R, ridden by Gregory Prince of Sherborn, Massachusetts, placed fifth overall after earning a Classic score of 151 and a Handy score of 185 for a total of 336. Kris Killam of Naples, Florida in the irons of Barbara Fishman’s Mr. Big finished in sixth place overall after earning a first round score of 156 and second round score of 175 for a total score of 331. Farmer returned for seventh with Jane Gaston’s Taken after earning a Classic score of 124 and a Handy score of 171 for a total of 295. Emily Terry Peterson of Naples, Florida rode Leslie Terry’s Pet Rock to the eighth place ribbon with a combined score of 280, and Farmer returned for ninth place in the irons of Kensel, LLC’s Clever Conversation with a combined score of 260. Megan Young of Jacksonville, Florida rode Lee Cesery’s Rockaway to the tenth place finish after earning a combined score of 258, and Claire Lee White of Ponte Vedra, Florida rode Janine Pappas’ Romanov to eleventh place after earning a combined score of 243. Farmer wrapped up the class with a twelfth place finish in the irons of Jane Gaston’s Because with a combined score of 237. For full results on this class, click here. The $10,000 Horseflight Open Welcome kicked off the jumper action Thursday afternoon and saw a field of 26 horse and rider teams compete in the indoor stadium at the Jacksonville Equestrian Center in Jacksonville, Florida. Allen Rheinheimer of Zionsville, Indiana, Course Designer and Technical Coordinator for the 2015 World Cup Finals, designed the course and set a first round time allowed of 90 seconds and second round time allowed of 45 seconds. David Jennings of Franklin, Tennessee in the irons of Masie McSwain and Full Circle Farm’s Blue Moon 22 were the first to go and turned in back to back clear rounds in times of 87.620 seconds and 41.261 seconds which set the new time to beat. Tracy Fenney of Flower Mound, Texas and MTM Farm’s MTM Full House were the next horse and rider team to turn in double clear rounds, taking the lead and setting the new time to beat at 38.801 seconds. Donegue, owned and ridden by Emma Willsky of Aspen, Colorado, turned in a clear first round effort in a time of 83.105 seconds. Although they turned in a second round with a time of 39.963 seconds, four faults would see the finish in ninth place. Aaron Vale of Williston, Florida and Thinks Like a Horse’s Spirit of Alena turned in a clear first round in a time of 82.948 seconds. However, eight jump faults and ten time faults in a second round time of 54.708 seconds would see them finish in eleventh place overall. MTM Axel, owned by MTM Farm and ridden by Dorothy Douglas of West Bridgewater, Massachusetts, turned in the next double clear rounds in times of 83.146 and 41.734 which would see them finish in fifth place overall. Jennings returned to the arena, this time in the irons of S & L Farm’s S & L Puppy Love, and turned in double clear rounds in times of 82.546 seconds and 38.870 seconds. Chanel Du Calvaire, owned and ridden by Francois Lamontagne of Saint Eustache, Quebec, Canada, followed Jennings with double clear rounds in times of 86.230 and 43.934 seconds which would see them finish in eighth place overall. Kyle Dewar of Ocala, Florida and his own Russell followed Lamontagne and posted a clear first round in a time of 83.527 seconds. Their second round in 46.942 seconds had eight jump and two time faults which would find them finish in tenth place overall. Fenney returned to the arena, this time in the irons of MTM Farm’s MTM Como No. The pair turned in double clear rounds in times of 87.137 seconds and 42.609 seconds, respectively, which would see them finish in seventh place overall. Jennings returned to the arena for his third ride in the irons of Lexander Farm, LLC’s Divace. After turning in a clear first round in a time of 84.528 seconds, Jennings knew he had to beat Fenney’s second round time of 38.801 seconds. Jennings did it! The pair turned in a clear second round in a time of 38.597 seconds and took the lead! Amanda Flint of Long Valley, New Jersey and the Coverboy Group’s Coverboy followed with the next clear first round in a time of 86.599 seconds. Four jump faults and fourteen time faults in a time of 58.117 seconds would see the pair finish in twelfth place overall. Final results had Jennings taking the win with Divace as well as third and fourth place ribbons with S & L Puppy Love and Blue Moon 22, respectively. Fenney took the second place honors with MTM Full House and seventh with MTM Como No. Dorothy Douglas grabbed the fifth and sixth place honors with MTM Axel and S & L Elite. The Jacksonville Spring Classic gets underway Thursday at the Jacksonville Equestrian Center and runs through April 24 for an action packed two AA weeks with lots in store and more than $200,000 in cash and awards up for grabs. The popular $1,000 Pre-Green Division will be offered both weeks for only $5.00 per horse. For a total of $2,000 up for grabs in both the 3′ and 3’3″ Divisions, the entry fee for the Division is only five dollars per horse. The $15,000 Horseflight Open Welcome takes place both weeks on Thursdays and the weekly $2,500 USHJA National Hunter Derbies, presented by Legend, takes place on Fridays. Friday morning will also feature the $15,000 USHJA International Hunter Derby, presented by Glen Kernan Golf and Country Club, which will take place on the beautiful grass Derby field and there will be a special, complimentary Derby breakfast ringside for all. Friday evening at 5pm, Boehringer-Ingelheim will have a special presentation of interest to all equestrians. Come see what the new USEF vaccination regulations mean to you. The presentation will take place in the stadium concourse. Food and refreshments will be served. Saturday of Week I the $35,000 Crescent Grove Advisors Grand Prix will take place Saturday night at 6 pm in the indoor stadium and VIP service will be offered. Tables of six are available for $200 and include an open bar and heavy hors d’oeuvres. Proceeds of all VIP tables will be donated to the Smiles Pets 4 Vets program run by Smiles Forever Animal Rescue, a 501c3 program that focuses on giving companion animals to Military Veterans. Buy a table and help this great program that benefits rescue dogs and veterans. Email Grace to reserve your table. Golf carts are available all week for $100 a day or $250 for the week. Get your reservations in early since there is a limited amount available. Email Alexis or call/text 904.993.2053 to reserve your golf cart now. The world-class Jacksonville Equestrian Center features a large indoor coliseum with seating for 3,700, two outdoor rings and a turf arena plus schooling rings and 500 permanent stalls. There are also 78 full hook-up RV spaces available. The Jacksonville Equestrian Center is conveniently located off of Interstate 295, I-10 and US 301 and in close proximity to the Jacksonville International Airport as well as the Cecil Field Regional Airport. The location is ideal for those traveling back from the winter circuits and for all Florida equestrians. “We are looking forward to an excellent show and are extremely pleased with our entries and sponsor support,” commented Bob Bell, President of the Classic Company. “We believe the added improvements made to the world class Jacksonville Equestrian Center combined with the Classic Company show production team’s efforts will provide an excellent show experience for our competitors,” he added. The prize list is online and entering is easy with horseshowsonline.com for no additional fees. Reserve your stalls now by emailing Alexis.